For a player with some obvious flaws, who joined Argyle after a couple of failed attempts to convert him from an attacking to a central midfielder, it’s quite surprising how important Antoni Sarcevic has become to Derek Adams’ team. His reintroduction to the team last Christmas proved to be a turning point in Argyle’s season as they transformed into a side capable of challenging for a play-off spot, before his injury saw Argyle stumble into the final straight. In fact, I am of the opinion that, had he been fit for the first weeks of this season, Argyle would be nowhere near the situation they are in currently. His absence shaped the performances of the side and heavily influenced the lack of goals, meaningful attacks, and points. His return against Wycombe brought about Argyle’s best performance of the season to that point; it would probably still be remembered as one of the best performances overall had it not been for a late equaliser that left a sour taste. But that’s getting ahead of ourselves. First, let’s focus on the player himself: his strengths, his weaknesses, and how Adams got the best out of him for two months last season as Argyle rocketed from 20th to 6th. *this only includes matches in which they started in central midfield, excluding the two games Sarcevic and O’Keefe started at right-midfield and four matches Grant started at left-midfield. Probably covering more ground than any of his teammates, Sarcevic closes down the opposition superbly, regularly picking the best moments to press and dispossess them while otherwise maintaining his position to deny them an easy route to goal. From central midfield he is only dribbled past 1.19 time per-90 minutes – put another way, for every occasion he is dribbled past, he makes three tackles. Of all of Argyle’s midfielders, only Conor Grant has a better beaten:tackle ratio, and that is more of a result of his less aggressive approach rather than greater ability. Even Songo’o, from a more protected defensive position, is dribbled past more often and has a worse ratio. As was discussed in part two, Fox is by far the least competent midfielder from a defensive perspective, but with the support of Sarcevic and Ness last season, he was protected from the majority of the defensive heavy lifting. Instead, this part of his role was mostly reduced to spotting the gaps and plugging them. It was this kind of tactical genius that helped to elevate a series of relatively average individuals – each with their own flaws – into one of the best midfields in the division. Adams put together a unit that accentuated each other’s strengths and minimized their weaknesses. Back to the matter at hand: not only does Sarcevic make the most defensive interventions among the other central midfielders, he also leads the team’s defence from the front. He is the player who most visibly directs the midfield during defensive phases, gesturing to his midfield partner when to come forward together and pointing other teammates into position (see examples below). When you put this combination of defensive technique, acumen and leadership together you get a very special player, one who is able to lead a team to defend on the front foot and protect their 18-yard box. Defending like this pushes the opposition midfield further backwards, which tends to push their wingers and strikers backwards too as they go in search of the ball. Obviously, the further from goal the opposition start their attacks, the harder it is for them to create goal-scoring chances. It is easy to perceive Sarcevic’s positive impact on the defence last season. Of Argyle’s run from Oldham to Peterborough (from the introduction of Lameiras and the 4-3-2-1 formation to Taylor’s injury), the defence kept 7 clean sheets from 18 matches. Five of these came in the ten matches Sarcevic started, in which the team conceded a goal every 122.3 minutes, but when he didn’t start the team only kept two in eight, conceding every 87.9 minutes. Break these numbers down even further and this will reveal the impact of his pressing style. Below, is a basic shot matrix diagram – pretentious name, I know, but I swear I didn’t come up with it. As you can see, collectively, the best areas to shoot from are zones 1, 2 and 3: hereafter known as the “danger zone”. Over the same time-period (Oldham to Peterborough), the opposition averaged almost exactly the same number of shots per-minute in the danger zone from open play regardless of whether Sarcevic started or not. However, when Sarcevic started, these shots were more likely to be taken under defensive pressure. With him in the side, an opponent shooting from open play was 20.3% more likely to be under pressure from at least one marker when shooting in the “danger zone”. Without him, an opponent was almost twice as likely to be shooting with only the ‘keeper between them and goal. Naturally, with more defensive pressure on the opposition attackers, this resulted in a much lower shot-conversion rate when Sarcevic was on the field. From open play, Argyle only conceded 5.26% of shots when Sarcevic started, compared to 12.24% when he did not. 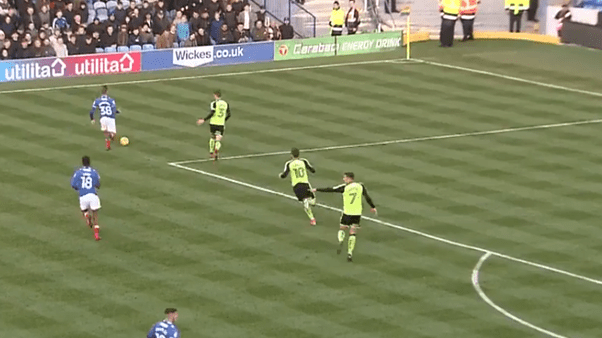 Of the eight conceded his ten starts, two came from counter attacks, one from a set-piece, one was Songo’o’s own goal against Oldham and the other came when Sonny Bradley’s intercepted pass, eight yards from goal, rebounded off Lyle Taylor’s boot and rolled in. Only three were from open play. This isn’t to say that after he was injured Argyle’s defence became a shambles overnight – one man does not make a team and Argyle still continued to perform well in matches – but with a leader and a very good defender taken off the pitch, the team began to give away better quality chances from open play more frequently. From this increase, more goals were scored. Though Makasi proved to be an able replacement, he made 42.4% fewer defensive actions per-90 minutes and certainly was not a defensive leader – instead, Ness had to take up that responsibility. So far this season Sarcevic has only played four games from his central midfield position, and with the constant rotations and defensive errors throughout that time the impact he has made has not been as noticeable. However, the rate at which defensive errors are made drops from one every 27.0 minutes to one every 44.1 minutes when Sarcevic starts in central midfield, which could be a sign of greater defensive organisation and leadership, though it could equally be a coincidence. What is not in doubt is that he has installed more steel and organisation from the centre of the pitch when he has played there: the six tackles he completed on his return from injury against Wycombe is the highest total achieved in a single game by any player this season, and it has already been detailed that no other player effects more dispossessions throughout the entire team than he. Yet, the return of Sarcevic to his best position would not only benefit the team at just one end of the pitch, as his other main contribution to the team is his attacking output. Firstly, Sarcevic is a very strong ball carrier, literally. Lameiras, Carey, Grant and Ladapo are all good at dribbling past an opponent using trickery and speed, but Sarcevic can operate as a battering ram to force his way through the opposition’s midfield line. Think less David Silva, more Yaya Toure: he beats players by positioning his body between them and the ball, using his strength and generating momentum. So far this season, only three players have averaged more than two dribbles per-90 minutes: Carey (3.05), Sarcevic (3.47) and Lameiras (3.52). If you remove the matches in which Sarcevic played at right midfield or defensive midfield and focus only on central midfield, then Sarcevic’s average rockets up to 4.61 dribbles per-90 minutes, the highest in the team, and from that position he is also the most efficient dribbler, being tackled once for every 1.15 dribbles he completes. Second, he brings a more aggressive style of passing to midfield. Averaging 1.84 high-risk passes per-90 minutes – at a ratio of just over 1 high-risk pass for every 10 low-risk passes he attempts – Sarcevic is willing to take a chance in possession to get the ball into a more advanced position. Finally, his attacking movement off the ball helps Carey and Lameiras to create chances. This is, in my opinion, his greatest strength, and it is important for two reasons. First, it helps to break the defensive line. If you can’t dribble your way through, then you need to pass your way through, but that cannot be achieved if there are no teammates available in space ahead of you. Carey and Lameiras work very well to provide each other with passing options to break the line, but two players without support can be marked, and their threat suffocated. Introduce a third runner – Sarcevic – and it becomes more difficult to contain them: once he breaks the line, the opposition have to reform their defence to face him, allowing Carey and Lameiras to reposition themselves to exploit the new defensive shape. Second, playing with just one striker can often mean that, regardless of the approach play, there are no player in the box to create a shooting opportunity for. In order for Carey or Lameiras to create a chance, there has to be a player to receive the pass and shoot. Again, Sarcevic does this job better than any of Argyle’s other midfielders. Last season, from his return against Bury to his virtually season ending injury against Bradford, Sarcevic hit 11 shots in the “danger zone”, 20.6% of Argyle’s total shots from that area during those matches. However, if you narrow this down even further – removing all shots from set pieces, free kicks and penalties – that percentage rockets up to 37.0%. That’s correct, more than a third of all of Argyle’s open play shots in the most dangerous area on the pitch in that time were taken by Sarcevic. In fact, during that entire stretch from Oldham to Peterborough, no player took shots in the “danger zone” more frequently than Sarcevic. His ability to get himself into dangerous positions in the opposition’s box is a perfect example of the kind of attacking movement that only he brings to this side from midfield. Whereas Ness prefers to infrequently make late third-man runs, Sarcevic – like with his defending – leads from the front. It is not uncommon for him to find himself as Argyle’s furthest forward player, drawing attention away from the sole striker. *this only includes matches in which they started in central midfield, excluding the two games Sarcevic started at right-midfield and four matches Grant started at left-midfield. Without him, Argyle’s midfield were far more conservative in possession and posed fewer questions of the opposition. Against Southend, playing in such a static, rigid style, the opposition were able to press Grant and Ness backwards and thus restrict Fox’s influence by forcing all three into a small area of the pitch and blocking the passing lanes. Consider the example below: as Argyle tried to pass their way out from the back, Grant (in possession) and Ness elected to pass conservatively and allowed Southend’s midfield to get close to them and to force them to drop deeper and pass backwards. This inverted the midfield three, leaving Fox as the midfielder furthest forward and preventing any simple forward passes. 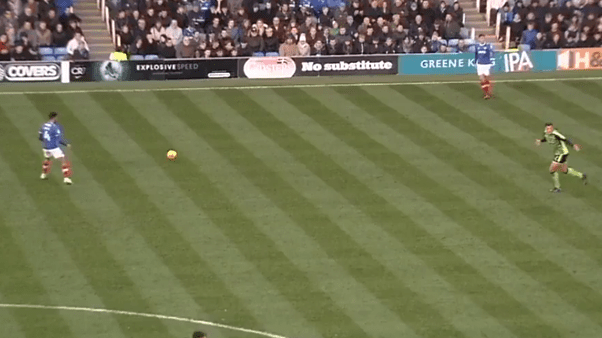 This kind of play occurred throughout the match and, as a result, Fox found himself unable to dictate possession, having little option other than to pass backwards or kick the ball upfield when he managed to get on the ball. As discussed in part two, for Fox to be fully effective in possession he needs space; last season this space was generated by Sarcevic or Makasi and Diagouraga or Ness pushing forward in midfield to drive the opposition backwards. Without any threat from Argyle’s midfield this time, Southend’s pressed from the front: Fox was nullified; Argyle found themselves passing backwards; and that led to endless long balls out from defence. The spit of possession demonstrated this: the midfield made only 23.1% of the team’s total passes while the defence made 51.1%. With more than half of the team’s passes being made by the defence, is it any wonder that Argyle barely threatened that day? The roots of this dreadful performance can be found in the midfield, and Sarcevic’s presence was sorely missed. Alternatively, against Walsall the midfield had plenty of the ball – completing nearly twice as many passes as they did against Southend – but that was because they were facing an opponent willing to sit deep and allow sterile possession. Of their 134 attempted passes, only 7 were high-risk and 6 of these were attempted by Fox. Between them, Ness and Grant barely made an attempt to break Walsall down, content to keep possession instead of taking a risk, like Sarcevic would have. Unsurprisingly, both Grant’s and Ness’s best performances have come alongside Sarcevic as he provides the perfect foil for them. With his willingness to drive forward in attack and lead the defence from the front, they are able to take a supporting role, half-way between Sarcevic’s high-risk, pressing game and Fox’s controlled, passing game. Removing either element and the midfield almost always loses its delicate balance: drop Fox and you’ll reduce the team’s control on the game; drop Sarcevic and you’ll reduce the attacking threat. Remove both and the team becomes defensive and possession becomes sterile. So, defensively solid and an attacking threat unlike any other player in the team, doesn’t that make Sarcevic the complete midfielder? Not quite. It’s the bits in-between that he struggles with. Most importantly, he needs to work on his passing, as he currently relies heavily on Fox to make up for his lack of discipline and technique. Sarcevic averages fewer passes per-90 minutes (22.2) than any other midfielder, while only Songo’o has a lower pass accuracy than his 70.5%. It is for this reason that he needs a deep-lying playmaker like Fox behind him and a more comfortable passer, like Ness or Grant, beside him. Second, his finishing needs a lot of work. He may get himself into great positions, but from those he needs to start converting more. Having ranked 15th out of 19 for shot accuracy last season, he’s yet to hit the target this year from his 13 shots. Should he hit form, there’s no reason why he shouldn’t go on to score anywhere between five and ten goals, but he needs to increase his goal return to take the next step forward in his career. Nevertheless, it is vital that Adams gets Sarcevic back to full fitness and reintroduces him to the line-up. He brings qualities to the team that nobody else in the squad possesses. In the right position – one that reduces his need to dictate the play but allows him to pressure the opposition in attack and defence – he is one of Argyle’s most valuable players. Bringing both he and Fox into the side, alongside another supporting midfielder such as Ness, Conor Grant or O’Keefe is bound to bring about an improvement in the team’s play. Following a couple of positive results but average performances against Barnsley and Wimbledon, the re-introduction of Sarcevic is exactly the shot in the arm this team needs to climb into a higher gear.